Once you are all dressed up in your bookish dresses and/or skirt, naturally you need a coordinating accessory in which to store all the books you are currently reading, along with a variety of notebooks and pens, because we should never leave the house without one of those. Notes: Interior pockets, a good size, and available in three colours. There’s also a matching purse! Both are leather, which rules it out as an option for vegans, but otherwise it’s quite lovely. Notes: Part of a series called ‘Book Club’ by Disaster Designs, there are also purses and clutch bags which are available. The lining is book print, which is gorgeous, and there are several pockets, including one handy zip pocket in the centre. Made from faux leather, this is vegan-friendly and very pretty. Notes: Whilst this is provided through a US website, the creator, John Allison, is a British comic writer and artist – of Scary-Go-Round, Bad Machinery, and Giant Days. I love everything he makes, I have a stash of t-shirts from his store, and I am coveting at least another two. And what beats a tote bag? Notes: The Literary Gift company do lots and lots of lovely book themed gifts – they’re a go-to for stocking fillers at Christmas for me. As mentioned, there’s no such thing as too many tote bags in the book industry, which is great because they sell LOADS. Notes: Too many tote bags, too little time. Fable and Black specialise in literary themed gifts, including pin badges, stationary and other pretty things. A decent price too, and a large selection of lovely designs. Notes: This is such a cute bag, and gives me a real Bookmaster vibe. There is also a messenger bag which is amazing. It zips open fully flat to reveal a laptop pocket, and places to stash your stationery. Downside, international shipping for an item this size will be somewhat steep. Notes: As well as the usual range of Penguin Classics tote bags, this place also has a small selection of quite fun totes for sale for a pretty reasonable price; along with some beautiful scarves for those in the market for literary neckwear. Notes: As with a lot of things on NotOnTheHighStreet, a bit pricier than some equivalent products; however since starting to move into a publishing career, nothing has yet convinced me that the above statement is not completely, 100% true. 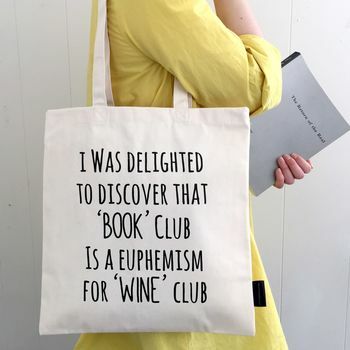 Waterstones also have a decent selection of tote bags on their website, in a variety of styles, but be careful – it’s hard to browse there and not end up buying a book or two as well.